Camp Woodland | Get Parent Pro Packing Tips! Get Parent Pro Packing Tips! Thank you Judy for writing great tips and tricks for all of our new camp families! Judy has a boy and girl at both camps. Judy went to Camp Woodland while her mom was the camp nurse for many seasons in the 1980s. Stick to the list for the most part. 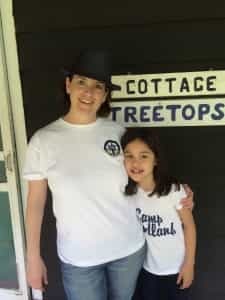 Camp Woodland has been in operation for 49+ years…the Jordan Family knows what works and what doesn’t at camp. Order the minimum recommended camp apparel and maybe one or two other items you know for a fact they will wear. I thought my daughter would love the “baseball jersey” Woodland shirt. She did not and it never got worn. She does love her sweatpants, though. The pajama bottoms are very popular, as well, and those get worn throughout the year. Don’t send your child to camp with an article of clothing (or any item) you/he/she would be devastated by if it were ruined/lost/misplaced. There really is no “fancy occasion” that requires formal attire. A romper or a simple dress is acceptable attire for Woodland’s banquet. One of the best things about camp is it truly is a place where everyone looks the same. Everyone dresses at the same very casual level of shorts, t-shirt, hoodie. Camp is the place to show your personality, not what kind of clothes you have. So it’s not going to matter if your kid’s riding jeans are from American Eagle or if they are from Walmart. No one seems to be able to tell the difference or even cares about that stuff. Just send the towels from Walmart or whatever happens to be laying around your house that you don’t mind never seeing again, because it may get mixed up in someone else’s bags on the way back. Label everything so it makes weekly laundry easier for the counselors. 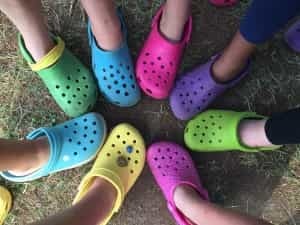 Get high quality flip flops such as “sliders” or “Crocs”. That seems to be what the kids live in all summer. Mark them with a Sharpie that shows up on whatever color they are. No dangly jewelry for every day, especially earrings…I still remember when a girl’s small hoop earring got caught on a tree branch on a trail ride…my mom was the camp nurse and had to take her to the emergency room for stitches. Leave the jewelry (except for a 5 year Woodland Pendant) at home and if your child does have pierced ears, make sure they have simple posts to wear for every day. Pro Tip: The best camp luggage is duffles. We got ours from LL Bean but everythingsummercamp.com has them, too, I believe. Plan on the process taking about 2 hours, maybe a little longer if this is your first time. I designate an area of our house as the packing area. Lay everything out in piles (10 socks, 12 shirts, bedding, etc. ) before packing anything in a duffle so you can double check everything as it goes in. I pack all of the bedding in one duffle and the clothing in another. The iron on ones don’t seem to stay in very well (and are time consuming). Just rubber stamp the name onto the white label of many clothes on the inside back of the collar or on the seam and get on with your life. Use the sticker labels for non-clothing items like water bottle, hair brush, shower stuff. Sharpie shoes on the inside exterior sole or where visible elsewhere on the shoe.